The standard 4-port test set comes with 12 front-panel access loops and a built-in second source. The loops provide access to the signal path between (a) the source output and the reference receiver, (b) the source output and directional coupler thru arm and (c) the coupled arm of the directional coupler and the port receiver. 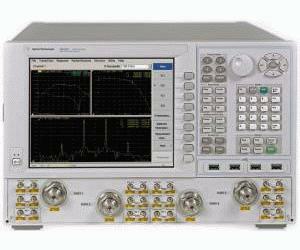 The internal second source provides an additional signal (fixed or swept) for two-tone third order-intercept (TOI) and intermodulation testing of amplifiers, or it can be used as a fast swept-LO signal for fixed-IF testing of mixers and converters. With two sources, source 1 is accessible through test ports 1 and 2, and source 2 is accessible through test ports 3 and 4. The standard test set also includes a solid-state internal RF transfer switch in the R1 reference receiver path.